I’ve been studying Myers-Briggs for about 15 years. It is the backbone for the Genius Assessment and one of the most persistently useful tools for understanding humans I have come across. It’s the ‘idea’ that I can’t stop making love to. And then I got introduced to the Enneagram about three years ago. I have to admit, I’ve been having an affair. Let me tell you why. When studying what makes people tick, there are a lot of angles from which to come and lots of models from which to choose. There’s how people were raised (the Birth Order), their level of development (the Graves Model), how they understand information and make decisions (Myers-Briggs), what motivates them (the Six Motivations), etc. We tend to erroneously place things in the “nature” or the “nurture” compartments, but since we’re only beginning to understand how grafted those two things are it’s still helpful to separate them. Some of what we study comes from an understanding of what’s intrinsic to us (“nature,” or our natural proclivities and talents) and what’s extrinsically influenced us (or, “nurture,” the context and experiences that have influenced how we see reality). Strategy isn’t just how we learn, evaluate or see ourselves in terms of life experiences. Strategy is how we decide we’re going to navigate the map, what tools we’ll be bringing and how we’re going to ‘auto-respond’ to threats. Two people could be the same Myers-Briggs type (they learn new information and make decisions similarly). They may both be, say, firstborn children. They could both be in an achievement period of their lives, and both feel motivated by gaining power. Yet, if their primary strategy for navigating the world is different, they might argue with you if you were to say they’re the same personality type in all of those other models! That’s how powerful strategy is. That’s where understanding the Enneagram comes in. Now, as with everything, there’s some disagreement about ‘nature’ and ‘nurture’ – are we born with our Enneagram type, or did we discover it? While I’m more in the camp of ‘born with it,’ it’s way easier to explain as something that we discovered. 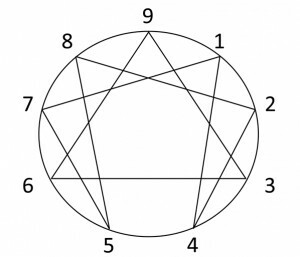 The Enneagram is a 9-pointed system. Each of the nine types is a different strategy for dealing with trauma. Some argue that you discovered your Enneagram type at your first childhood trauma, and it’s been with you ever since. Considering side-stepping, mitigating, handling and dealing with trauma is a big deal for the psyche, your mind created a ‘go-to strategy’ for navigating it, and so your Enneagram type – your “trauma navigation tool” – is born and subsequently becomes an influential part of you. It’s with you all the time, and since your brain is an ecosystem of self-referencing concepts which get folded into other concepts, your Enneagram type impacts you in a number of ways you may not be able to predict. 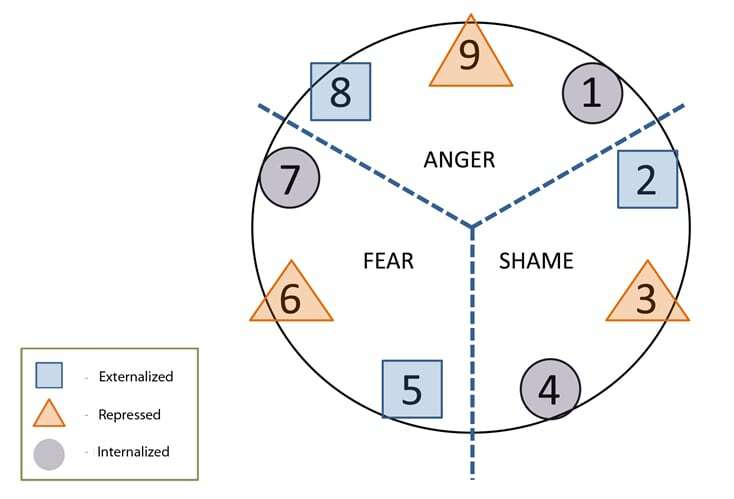 The 9 Types are divided into 3 triads that are hyperfocused (in an unhealthy way) on one of three emotions: Fear, Anger, and Shame. 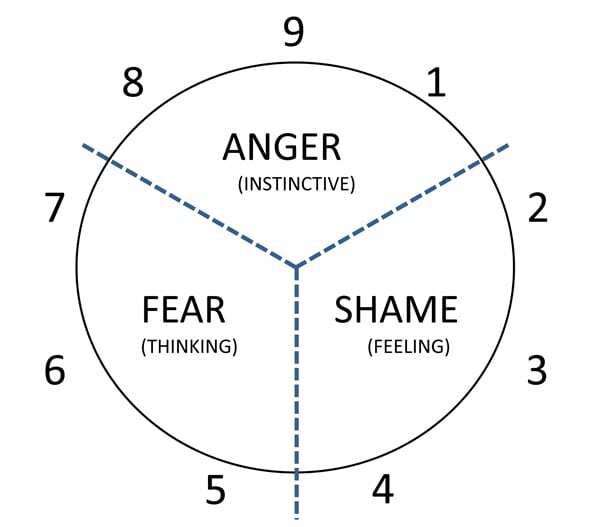 Now, obviously all of us can feel all three of these emotions, and part of the theory behind the Enneagram is that all nine types dwell within us. However, one is our favorite, go-to tool in our toolbox (like Myers-Briggs! ), and thus our preference – or, ‘type’ – is born. That’s the most zoomed out layer. One more zoom in and we see that there are three numbers within each triad. These also have a pattern they follow. The second number in each triad “represses” the emotion that it’s hyperfocused upon. So, 9-3-6 attempt to repress their emotion. 9 ‘represses’ anger, 3 ‘represses’ shame, and 6 ‘ represses’ fear. The third number in each triad “internalizes” the emotion that it’s hyperfocused upon. 1-4-7 attempt to internalize their emotion. 1 ‘internalizes’ anger, 4 ‘internalizes’ shame, and 7 ‘internalizes’ fear. The types that ‘internalize’ tend to turn the emotion in on themselves or experience the emotion inwardly, those that ‘externalize’ experience the emotion outside of themselves or project it outwardly, and those that repress the emotion do what they can to pretend the emotion doesn’t exist for them at all. Externalizes, or expresses, anger as the primary strategy for getting what they want and for dealing with stresses/challenges. There’s a tendency to bulldoze through life, and let you feel their anger if they don’t get it. 8’s tend to be self-confident, decisive, willful and confrontational. Represses anger as the primary strategy. They don’t like showing or even acknowledging anger, and so tend to ‘smolder’ underneath. Of course, they don’t let on to the self or others that they’re stewing. 9’s tend to be receptive, reassuring, complacent, resigned. Internalizes, or focuses their anger, inwardly. This leads to a perfectionistic streak. Since they give themselves no mercy, they tend to be judgmental of others, as well. 1’s are principled, purposeful, self-controlled and perfectionistic. Externalizes, or focuses their shame, outwardly. Their shame is your problem, and thus your problem to solve. If you can give them enough feedback that they’re of value to you, it soothes their soul. They’ll do whatever they can to get that feedback and so are often totally focused on getting others needs met and neglecting their own. 2’s are generous, demonstrative, people-pleasing and possessive. 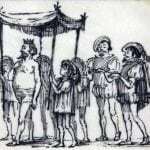 Represses shame as a primary strategy. Just like 9’s who have a distaste of their own intrinsic anger, 3’s are forever running away from their secret fear of having no value or worth. In order to quiet the thought, they do whatever they can to “prove” such a thing is ridiculous. 3’s are driven, adaptable, excelling and image-conscious. Internalizes, or focuses their shame, inwardly. There’s no way anyone else could possibly understand what they deal with, and they are wholly unique. The desire for uniqueness and emotional depth gives a feeling of artistic melancholy in average 4’s. They tend to be intuitive, unique, self-absorbed and temperamental. Externalizes, or experiences their fear, outwardly. The world is a scary place, and preparation is the key to dealing with it. 5’s are forever in strategy mode, knowing if they could just hone their skills enough they’ll be ready for the scary world ‘out there.’ 5’s tend to be perceptive, innovative, secretive and isolated. Represses fear as a primary strategy. Like the 9’s and 3’s, 6’s are just as good at pretending there is absolutely no reason ever to feel fear. They repress it by surrounding themselves with safety/security systems (often in the form of people), and by being suspicious of the unfamiliar. Since they can neither trust themselves or the outside world, but they can’t actually experience it as ‘fear,’ there is a Janus-like quality to 6’s. They are engaging, responsible, anxious and suspicious. Internalizes, or experiences their fear, inwardly. The outside world is filled with fun, but inside… There be dragons. So 7’s flee from the inner world and gorge on the outer world of pleasures and possibilities. 7’s tend to be versatile, acquisitive, spontaneous, scattered, a total blast to be around – but tough to pin down. Did you find yourself in any of these strategies? If you could identify yourself in more than one, that’s because you are in more than one. However, your primary Enneagram type is well worth discovering, as identification is just the first step. The second step is growth. Which is why I love understanding the Enneagram system. 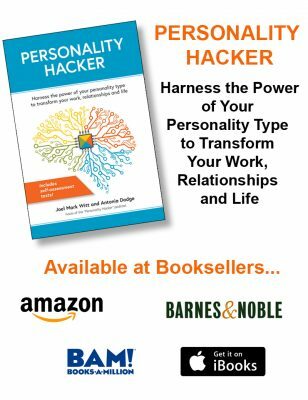 While I personally believe that Myers-Briggs (and the Personality Hacker take on MB, the Genius System) has personal development built into the system, I know most MB enthusiasts are comfortable just understanding the system. 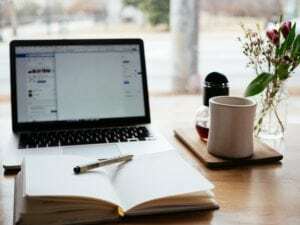 However, with the Enneagram, the stated purpose is to grow to a place where your go-to strategy is no longer a hyperfocus, no longer something that can hurt you by being a one-trick pony. 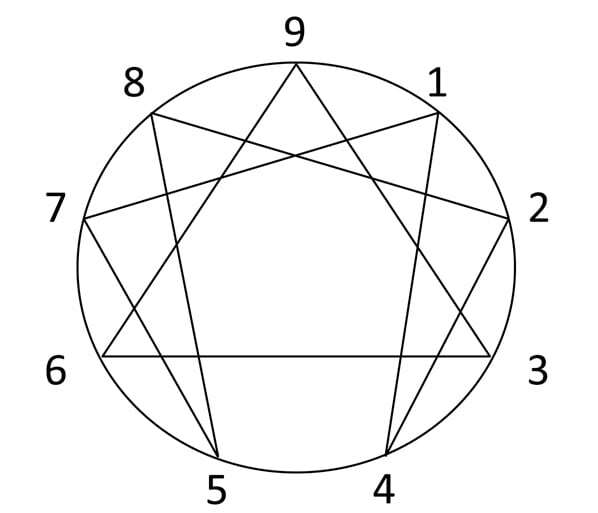 There are nine levels of development for each Enneagram type, with three levels of ‘unhealthy,’ three levels of ‘average’ and three levels of ‘healthy’ development. That’s a little deeper than we’ll be diving into in this post. Suffice to say, acknowledging that our strategy may not be the end-all, be-all in dealing with life, and to surrender to our ultimate fear is powerful stuff. In unhealthy 3’s, the response is to be a chameleon of value – no matter what you want me to be (or what I perceive you want me to be), I’ll be! Give me a mountain to climb, pat me on the head and tell me I’m oh so worthy! YOU set the tone, and I’ll follow you… until, for some reason, you withhold approval from me, and suddenly I’m collapsing in on myself. To be a healthy three is to find self-worth and self-value. Not to dance to other people’s fiddles, but to be self-directed and hold strong in my own identity and sense of value. As in, I’m valuable just by being me. I have intrinsic worth. Anything else I give is gravy. Holding that understanding has been massive in my personal development. And, of course, there’s one for every type. 8’s realize… there is no contradiction between being sensitive to the hearts of others and being a force in the world. In fact, the more they connect with others, the more they become a powerful force for good in the world. Healthy 8’s can become the kind of leader for which others fall on their swords. 9’s realize… that staying with the discomfort of the moment, being present and being willing to engage even if there’s confrontation, is the key to true inner peace. When 9’s stay present and don’t retreat from anger or other negative emotions, they can become their best selves, helping others feel truly loved and accepted with limitless patience and a true creator of peace. 1’s realize… that they aren’t responsible for fixing everything. That accepting a situation isn’t the same as endorsing it, and they can still accomplish a higher good while having patience with ‘what is.’ When 1’s are at their peak, they are conscientious, accepting, serene and inspiring missionaries for a just cause. 2’s realize… that getting their own needs met doesn’t mean they’re neglecting everyone else. It is, in fact, the opposite. When the needs of the self go unmet, the result is exhaustion and manipulation. When 2’s finally see that their own needs are neither more or less important than others, they are sincerely generous, nurturing, unconditionally loving, gracious, and humble. 3’s realize… as I mentioned before that they have intrinsic value. They don’t have to ‘be’ or ‘do’ anything. And since there’s already a focus on the preciousness of life, 3’s are at their best when they’re Bigger Game contributors. 4’s realize… there is richness and depth in ordinary experiences. They don’t have to be exotic to be unique. 4’s are at their best when they move away from emotional indulgence and move toward being authentically connected to their heart. 4’s see beauty everywhere when at their best. 5’s realize… they have all the information and understanding they need to truly engage in and live life. There is a host of inner resources, and there’s no need to simply sit by observing or being a spectator in life. When 5’s stop being the chrysalis and start being the butterfly, they are visionaries with groundbreaking insights. 7’s realize… that there is wonder in each moment. There’s no need to flee unpleasant feelings or feel trapped. Being here and now is the only true freedom. Healthy 7’s inspire others with their deep gratitude and wonder of the world. So, what do you need to realize? How can you meditate on your strategy, and better yet, remember it’s just a strategy? And, powerfully, how can you both accept and love yourself and your strategy fully? What would you look like at your best and at your healthiest? I couldn’t help but notice that at the end of the post where it breaks down what each type realizes, that a valuable contribution beneficial to society was listed for each type at their best, except for the four. I’ve seen this as a common trend in Enneagram literature. The only thing mentioned was that fours will see beauty everywhere when at their best. That sounds very useless. It looks like every type has value except the four – that they are dead weight on society with nothing to offer, because they are too busy trying to be unique or see beauty. Fours are artists, and art has a very valuable place in society and culture. It is a very valuable contribution and fours have the right to exist and not be viewed as self indulgent dead weight. Just food for thought. I am a INFP 6w5 4sp I find it so interesting and can completely relate to all of it ! Amazingly and concisely written; this article helped me understand enneagram after years of confusion! I found my self in ESTJ, and Type 7w8. do you think the correlation is probably right? and also I need to have a brief summary on the correlation b/n Enneagram types and MBTI types, so could you help me please? Antonia, an enneagram 3? No way! A sexual subtype 3 – which is a bit different than how 3s are usually presented. But yeah – it hits straight to the core of my DNA. It would be helpful if there is a way to confirm which category/number I belong to… The obvervation that I conducted for myself and the obvervation others conducted for me are conpletely different. And I dont know which one is correct or near to the real me. We can not categorize ourselves into 7 or 9 just because we think that’s where we belong. A test from both side is required. And the way others perceive you. This was immensely helpful; I think I finally understand which enneagram type I belong to now. Thank you for a thorough article! This is genius…I have always been frustrated with the Enneagram assessment until now. You are the first person to explain the premise in a way that makes sense to me. After learning that I am an INTJ in all of its glory…..pretty sure you’ve been stalking me…..I retested as a 1 with 2 wing which nailed me to a T. Do you do any personal phone assessment to help me decide which of your programs to do? Hi Blake! Thanks for the feedback! It depends on where you are in your personal growth journey. If you aren’t sure where to begin, you might enjoy Your Personality: The Owner’s Manual. It’s a You Are Here dot for personal development. I think it’s interesting because Antonia explains another model called The Graves Model. I’m not sure if you are familiar with it, but it is a game changer all by itself. If you feel you are just finding out you are intuitive and want to know what that means, you might consider Intuitive Awakening. It’s what every intuitive wishes they had known as a child. We have other programs, but these are the ones that people usually start with. You also get a free INTJ Starter Kit with the purchase. Wonderful article! I learned a lot. Thanks! This was so informative. This perfectly explains why I’m so different from other ESTJs, because I’m a 9w1. So I’m more quiet and easy-going than most. It’s as if a light bulb has been activated in my brain. Thank you very much for this explanation. I am INFP type 6. I do not relate to everything that is said about sixes (on various other enneagram websites). 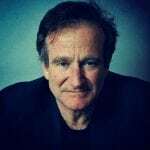 Since I have had some form of anxiety as long as I remember either social or generalized or both, I am not sure that I am able to distinguish my now diagnosed anxiety disorders and ea 6. I am taking medications for it. Some infps doubt my infp type since they could not be ea 6 or are rather rare. Please help! I know that I am INFP since I took an official test, read a ton about type, have clear understanding of Jungian functions, did essays on MBTI – studied it on a graduate level as a part of org. behavior course. Thank you! This is amazing! My wife has loved and spoken and understood Myers-Briggs for 15+ years, while it all went right over my head. She is an ENFP, and I was young and dumb. Your personality hacker podcasts went over my head for ages, while my wife picked out more and more. But finally one day MB types started to ‘Click’ after I took your test and listened to podcasts. I soooo love both yours and Joel’s work explaining MB and expanding it further to the CAR model. NOW THIS! Enneagram, another thing that went over my head for years that my wife talked about and loved! But your breakdown of the Enneagram has finally broken the brain fog for me too. I really want to thank you guys and show appreciation for your work and love of all things personality and improvement and hacks. Now I have to take the Enneagram. I’ve avoided it because it has too many sections (apparently, that’s my N). Because I work with trauma, this is now very much worth exploring. ENFP, Fairly certain I’m type 9. I’m not really sure how to bring my anger out. I quite obviously repress my anger though, specifically I can remember when my parents bought me a fairly “snooty” t-shirt that read “If the music’s too loud, you’re too old!”; I never wear it. What’s your opinion of “wings”with Enneagrams? And how do you think Enneagrams correlate with MBTI? 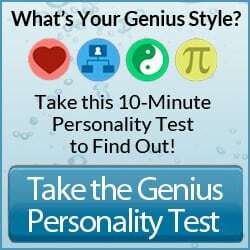 I’ve found most ENTP’s come out as 7’s, with a few 5’s. I took the actual test for MBTI given to me by a marriage counselor (ENTP), but I’ve only ever taken the free Enneagram type tests online. It puts me as a 5. So I’m an oddball even among the oddballs apparently. Either way, I find it interesting that so many ENTP’s are typed as 7’s. Thanks again for the great information! I hope you don’t mind me asking for more. This is so helpful!!! I’m an INFP and have always struggled with the Enneagram system, never really deciding on what type I am. It has always come down to 9, 2 and 4. Most recently 9 and 4. Based on this… I’m probably a 9. Especially when I consider interactions with other INFPs, a lot of whom are probably 4s, which helps me understand our differences a little more. As always the information and ideas you re bringing are helpful and powerful. I would like to know if there are enneagram type tests? Is there one available in this website? Thank you for your work in this realm of life, and for sharing it with us. Any a gram institute link no longer works. My apologies. My voice-to-text misspelled Enneagram. The link you provided does not work. I am new to Enneagram. I only know Suzanne Stabile.